After the Cookie Mela, I thought I should be thinking about something substantial like a quick meal. Consider this as a quick express meal or under 30 minutes meal. Entries for this mela, should be a complete meal prepared within 30 mins. Can use ingredients that are pre-soaked, pre-fermented like Channa, Dosa/Idli batter etc. Rest of it is not accepted. Even Rice soaking has to be within the 30 mins. The entries can be any course, but a complete meal. Be it for breakfast, Brunch, Lunch or Supper. All the dishes showcased should be prepared within 30 mins. Please don't send just the side dish, you need to account for the entire complete meal to be prepared in 30 mins. If you want to send a gravy, you need to also show what you served it with, be it rice or roti and the time you took to make it. So the entry will quality only if it's a complete meal and not just one dish that you can't eat without any accompaniment. 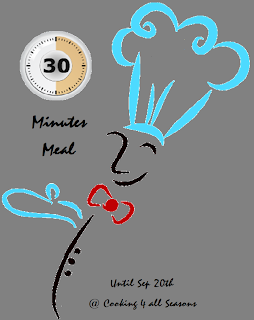 From now till September 20th, cook up a meal under 30 mins and send them to me! Both Veg and Non Veg are are accepted. Archive entries after May 2012 are accepted, provided it has a link back to this announcement.